The City of Garden Grove currently does not limit the amount of contributions made to committees for the elected offices of Mayor or Council member. 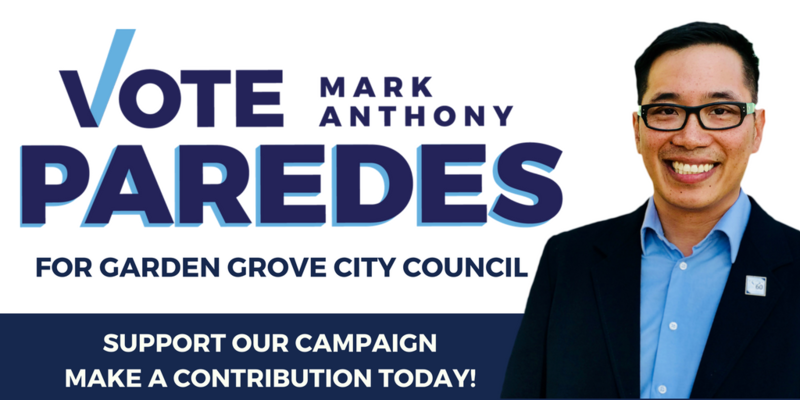 Contributions to Mark Anthony Paredes for Garden Grove City Council are not deductible for state or federal income tax purposes. I can't be more proud to have him as a friend. I known Mark for over 37 years and since knowing Mark for such a long time I've never met more of an honest caring individual. Mark was voted most likely to succeed in my high school. Mark is a very highly intelligent person who is able to be successful in whatever he puts his mind into but he's also very humble. Mark usually puts his mind to to not helping himself be successful but the success of people around him in his community and his friends. Mark has a unique way of thinking outside the box and finding a solution through the toughest situations.He has the passion to help people around him to make their lives better.The city of Garden Grove would be lucky to have such a council member. I would trust Mark with my own life I couldn't ask for a better friend throughout the years. Mark Paredes will be a great City Council for Garden Grove. He truly cares about the community and will continue to improve the lives of the residents. Keep up the good work. I have known Mark for many years and I cannot think of anyone else who would approach the betterment of his city like he can. I have known Mark for over 25 years. He is incredibly passionate about his community and always puts the needs of others before his own. I cannot think of anyone more qualified for Garden Grove City Council than Mark Paredes. Mark Paredes will make an excellent contribution to Garden Grove’s City Council! He cares enough not only to talk about change for the better but is taking action by running for council. Mark will definitely lead with both his heart and head by helping improve the lives for residents of Garden Grove. I’m so happy to contribute to Mark’s cause. He is an extraordinary man whose morals & care for the community have been inspirational. I look forward to seeing all the positive change he will continue to bring to the community. The right person for the job. I don’t know anyone more dedicated to their community than you. I trust and believe in your leadership.